The series ‘When Hikaru was on the Earth……’ finally ends at the final volume ‘Fujitsubo’. Whenever I write a new story, I will first think of the ending, before working my way to the end. My heart really pounds when whenever I write, thinking about how to reach the end, to meet the expected number of volumes, and to see the readers’ satisfaction at the end. Once I do manage to reach the destination, I will heave a sigh of relief, going ‘Ahh, thank goodness’. Thanks to everyone, the ‘Hikaru’ series managed to end without a hitch. I really do wish to thank all the readers who sent their messages, the readers who helped promote the books, and the readers who bought the bookson the days the volumes were released. I will like to earnestly thank all the readers who kept reading the ‘Hikaru’ series and supported this work. The plot of ‘When Hikaru was on the Earth…’ includes the ‘Genji Monogatari’, and also ‘the Little Prince’ by Saint Exupery. The biggest hint would be the ‘smiling flower’. Well, the Prince is the star that gives me the ‘smile’. Hikaru gave a smiling flower to Koremitsu. The child Fujino gave birth to is named ‘Kaoru’, not ‘Izumi’. Hikaru never left anything tangible behind, but he bade farewell, leaving behind many ethereal things. I hope this is the kind of story I wrote. There will be a new series starting from the upcoming 31st May. The title is, “You Who Became a Vampire Begi an Eternal Love’. It is the story of a boy who became a vampire, fell in love, felt conflicted within, and continued to move forward. It is a slightly depressing story. ‘Riku and Chise ~ The Boy who distributed the leaflets of the world, and the girl in the resort’. This is a story I really, really want to wriite, and now it finally happened. It is a plain story, but an important start-off story for me. 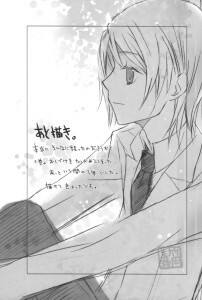 Currently, there is a campaign wherein that any reader who buys the three stories, including the last ‘Hikaru’ volume, will be gifted a book containing side stories and design illustrations, so do participate in it. It really is just a little, but I do wish to write a story of Koremitsu and Honoka spending Christmas Eve together. Now thehn, I do hope that we will meet in the next month, or the month after that. Unfortunately, I don’t have a lot of romance stories that aren’t harem. For this one, the closest equivalent will be Amaryllis. is that so?well as long as it has romance..is amaryllis ended already?